It is said that if it was not for potatoes and herring, Norwegians would have starved during the last centuries. Different techniques of preserving herring have been used at different times in Norwegian history. One tradition that is believed to be very old is smoked herring. It was hung to dry from the ceiling above the open fireplace and thus acquired a smoky flavor. The smoke prevented the fish from getting moldy, and if it was lightly salted it would keep in a storehouse all winter. It was eaten either fried in its own fat on hot stones on the fireplace, or eaten raw, boiled, fried in butter or simmered in beer. Fermented herring seems to have been popular from the 15th to the 19th centuries and preferred by the population on the west coast. It was only slightly salted and had a strong, sour smell. In fact, the more sour it smelled, the better. the 20th century the fermented herring slowly began to be replaced by the fully salted herring (Spekesild), as well as smoked and dried herring, as every day food. 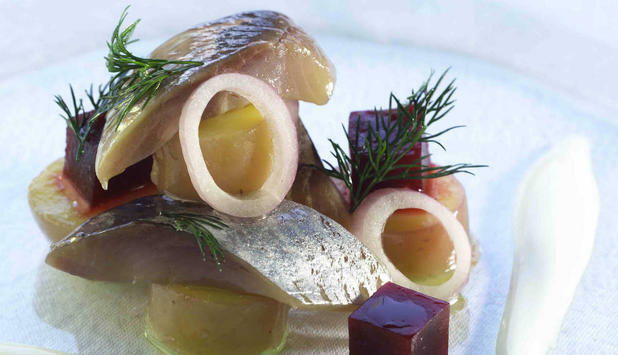 Today, pickled herring is most commonly seen in the homes and hotels of Scandinavia. You need cleaned fillets of herring without bones. The fatter the herring, the better. Sprinkle a layer of coarse salt in the bottom of a clean barrel or the like. Add the herring fillets, gently, side by side. Sprinkle salt between each layer. You need about 2.2 lbs of salt per. 8.8 lbs of fillets. Leave it in the salt with a light pressure for about 12 hours. Make a brine of 2.2 lbs of salt and 1 gallon of water and pour this over the herring. Put on a lid and keep the barrel in room temperature for 14 days, then move it to a cold place. After 4-5 weeks you can use the Spekesild. If you want, add a little sugar into the brine, about 1.8 oz per 2.2 lbs of salt. Sugar makes the herring a bit milder in flavor. Served with boiled potatoes, raw onions, beets and sour cream. ‹ The Nordic Letters Æ, Ø and Å – How Did They Get There?